Pastor Butch is a knowledgeable, passionate teacher and sought-after conference speaker, whose heart is to see Christians grow in their understanding of God. Using the rich Hebraic heritage of Christianity, Pastor Butch teaches on many different topics from marital relationships to Bible prophecy, but always with the same purpose and goal in mind: to help Christians grow in their intimacy with God. Jeremiah 9:23-24 clearly tells us the most important thing for believers is that we grow in our knowledge and understanding of God. As they do, they will understand God desires an intimate relationship with each blood-bought, spirit-filled Christian. The goal and purpose of this ministry is to assist God’s people in cultivating such a relationship with their Creator. has a heart to disciple the body of Christ and a passion to restore the biblical roots of the Christian faith. believes that human beings were created for relationships – with others and with God. believes the more Christians learn about their Hebraic/Jewish roots, the more blessed they will be in their Christian lives and the more intimacy they will experience with God. believes in and promotes Jewish Christian dialogue, helping to heal the wounds of the past and build “one” new man (of both Jew and Gentile), serving under one King (Jesus). believes and teaches with great passion Israel’s place in God’s plan for the redemption of the world. He believes in order to understand what God is doing in the world today and what our future holds, one must have a clear understanding of the Jewish people, their return to the Holy Land and the reestablishment of Israel as a nation. believes and teaches that reading the Bible through “Hebrew eyes” will give the student a deeper, richer, and clearer understanding of God and His Word. Pastor Butch and his wife Debi have four sons, two daughters, three grandsons and one granddaughter. 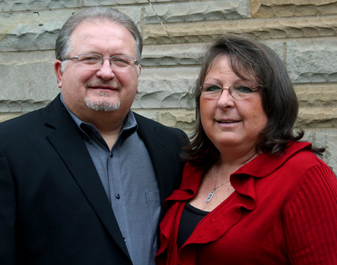 They reside in southern Ohio and pastor Church of the King, a church with two locations: Ironton, OH and Jackson, OH. He has spent time in Israel studying the Hebrew language and holds a Master of Religious Education in Middle Eastern History from the American Institute for Advanced Biblical Studies. He also currently serves as an instructor and Dean of the Ephesians 4 School of Ministry.